MOSCOW (Sputnik) - About 600 people have been killed in Syria's Eastern Ghouta since February 18 and over 2,000 have been injured, Panos Moumtzis, Regional Humanitarian Coordinator for the Syria Crisis, said in a statement Sunday. 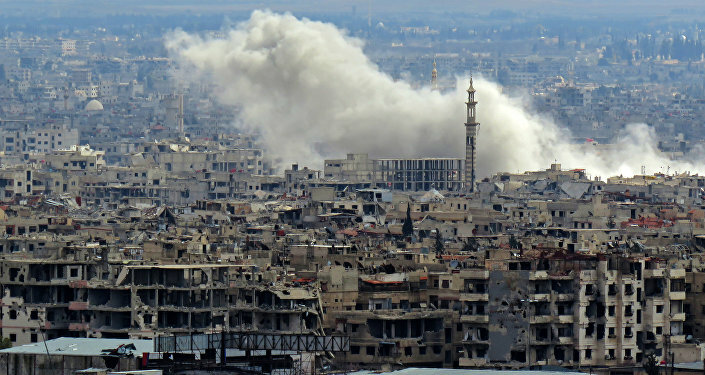 "Since 18 February, close to 600 people have reportedly been killed in air and ground-based strikes on the besieged enclave, while over 2,000 people have been injured. At the same time, ground-based strikes and mortar shelling from eastern Ghouta have killed and injured scores of civilians in neighboring Damascus," Moumtzis said. The UN coordinator stressed that he remained concerned for the safety of civilians in Syria even after the UN Security Council vote to adopt Resolution 2401 on February 24 for a one-month ceasefire across Syria. "Not only has this not happened, in some cases the violence has escalated, particularly for the close to 400,000 men, women and children of East Ghouta. Instead of a much needed reprieve, we continue to see more fighting, more death, and more disturbing reports of hunger and hospitals being bombed," the statement read. According to the UN, 385,000 people have been displaced since December. Russian Defense Minister Sergei Shoigu said Monday that a daily humanitarian pause was introduced in Eastern Ghouta, between 9 a.m. and 2 p.m. local time (7:00 to 12:00 GMT). According to the Russian military, militants have been preventing civilians from leaving Eastern Ghouta through the humanitarian corridor.